Unique lift-off system. Non-snag chassis design. Easy access. Unique push/pull handle. 2 small service caddies - green and yellow. 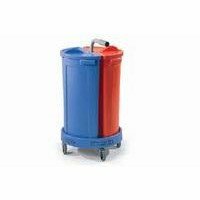 2 large service caddies - red and blue. Huge storage capacity. Heavy duty non-marking castors.